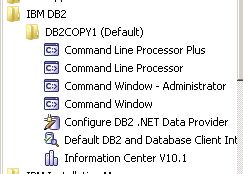 Selecting ‘Configure DB2 .Net Data Provider” calls up a GUI interface that walks you through setting up a datasource. 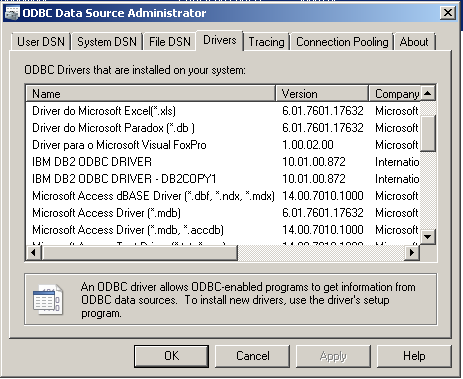 To find the ODBC Manager under Windows 7 or 8 go to Control Panel and click on System and Security then click on Administrative Tools. Each driver is configured to connect to a specific server and port. The configuration is stored in db2cli.ini and db2dsdriver.cfg. But what if you want to change the server or port address for a datasource. Or in my case, add multiple datasources pointing to different servers? Well you could try running the GUI tool again but that decision was made for me when Windows 7 decided to stop running the file and I decided I preferred to have more visibility / control of the configuration. So instead I chose to use the command line to change and create new datasources. That writes a new datasource called PEOPLEDB_SA (you can call it what you want so long as it’s unique) that is connecting to a database called PEOPLEDB on server db2.turtlehost.net port 50000. You don’t need to be able to connect to the database when you run the db2cli – it doesn’t validate or test at this point. When you’re all done you need to restart Windows for the new registry to be read by AQT and you can go ahead and test the connection and use AQT to connect to the database by choosing the PEOPLE_SA datasource. Writing to a log file isn’t compulsory but I always do so I can check if the script ran OK. It would be nice if the IBM documentation was correct but it’s a simple problem to catch and fix.